The tiny island of Key West is home to probably as many talented musicians per square mile as Nashville and New Orleans. Noted for it’s rich history or writers and artists it has also been home to legendary musicians like Jimmy Buffett, Paul Cotton from Poco fame, Scott Kirby and many, many more! World famous author and songwriter Shel Silverstein live many years in Key West until his untimely death in May of 1999. He often collaborated with local musicians like Michael McCloud , Captain Dan Mobley and more. Most recently, Howard Livingston and his Key West Mile Marker 24 band have emerged as the number one Trop Rock band for 2009 taking four honors: Band of the Year, Entertainer of the Year, CD of the Year for “I’m Living On an Island” and Song of the Year, same title. Artists like these have made famous Key West Music. Jimmy Buffet, who popularized the laid back beach bum lifestyle established this attitude while being introduced to Key West where he moved during the early 70’s. In 1985, the singer/songwriter/film producer/author created and opened the first of his famous Margaritaville restaurants in Key West. Simply walking along the world famous Duval Street past open air bars like Sloppy Joes, Hog’s Breathe Saloon, Captain Tony’s and dozens more the sounds of original Key West music fills the air. Each year Key West is host to hundreds of singer/songwriters from all over the world at a music festival called the Key West Songwriter’s Festival. There are more than 30 shows on 25 stages held during 5 days and nights. It’s all about Key West music. This year a new internet radio station emerged to become heralded as the number one Trop Rock Internet Radio Station. 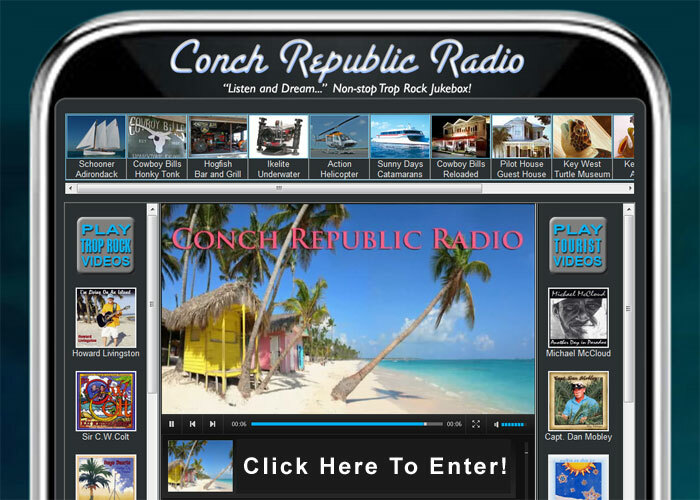 It’s called Conch Republic Radio and plays non-stop island music 24/7 directly from the Key West radio station. Situated right around the corner from the Margaritaville Cafe, it often produces video segments about the visiting musicians and simulcasts them on ConchTV and Conch Republic Radio. It’s the perfect place to listen to Key West Music. A trip to Key West is a vacation to one of the music capitols of America and will surely evoke a deep desire to leave the rat race behind. Soak up the tropical sun while listening to original Key West Music playing in the breezes and sip a cold beer. While maybe not the center of the universe, it certainly comes close to being paradise.